After four consecutive defeats, yesterday’s 2-0 home win against Wolves was more than welcome. It might not have moved us up any places in the table but it’s given us a bit of breathing space as we look to secure enough points to keep us in the Premier League. Football has a habit of throwing up coincidences and it did just that again. When Sean Dyche became Burnley manager, he kicked off with a home game against Wolves. Yesterday, as he celebrated 300 games in charge, it was Wolves at home again and incredibly we won by the same 2-0 scoreline as we did back in November 2012. “We’ve come a long way since then,” you will hear people say so it is interesting looking back at that game to see that of those who started, only two are at Turf Moor now and both played at left-back. Ben Mee occupied that position for us whilst Stephen Ward did for Wolves. For the record, our team was: Lee Grant, Kieran Trippier, Michael Duff, Jason Shackell, Ben Mee, David Edgar, Dean Marney, Brian Stock, Ross Wallace, Charlie Austin, Martin Paterson with Paterson and Austin getting the goals. I don’t like playing Wolves at home. It’s nothing personal; it’s just that we haven’t had the best record against them on the Turf in my years. It all started well enough with three wins out of four in the early 1960s but then our record deteriorated somewhat. In 25 home league games against them since, we’ve won just four. There was the Boxing Day 2-1 win in 2002 with goals from Gareth Taylor and Dean West and we beat them 1-0 in the 2008/09 promotion season when Chris McCann scored an early goal to add to the now two wins under Dyche. So, I’m never confident when the old gold shirts roll into town and given our recent run of results I was more than a little concerned yesterday when I made my way down to the Turf given how important it was for us to get some points. There had been some doubt over the fitness of Jόhann Berg Guðmundsson ahead of the game. He was fit, but, in the one change, lost his place in the starting line up to Jeff Hendrick. He took his place on the bench that showed one other change with Stephen Ward in for Peter Crouch. We’d lost the previous two home games against Crystal Palace and Leicester; Wolves, in my view, are a better team than either of those two but this time we got our noses in front with only around ninety seconds gone after Wolves had conceded the first free kick of the game. Dwight McNeil took the free kick and it was inch perfect, over the Wolves defence for Chris Wood to run on to. Wood got it right too. His first touch took him past goalkeeper Rui Patrício and his second initially appeared to have been a shot into the net. A second look showed it had hit the post with Wolves’ defender Conor Coady unable to do anything other than help it in. Coady hasn’t scored a goal for Wolves this season, but this was his third own goal since mid-January. If anyone thought this would lead to an expansive performance from the Clarets to win with ease against Wolves, they were very mistaken and for long spells we had more than our fair share of defending to do. Both teams had penalty shouts in the first half but both were turned down. Ashley Barnes was the central character in both. He went down with a defender’s arm around his neck before, just a few minutes later, potentially handling the ball at the other end. Referee Chris Kavanagh waved them both away. This morning, former West Brom manager Darren Moore laughingly suggested that VAR would have turned the decision round and given them one. Having seem them both, I think the referee got both decisions correct. Tom Heaton came quickly off his line to gather a through ball before they could get onto it and such was our defending that I think that was probably the only real piece of action he had in the first half. We’d got to half time in front but things got more difficult for us in the second half for a while as Wolves dominated the game, dominated the possession. They put us under some pressure but no matter what they tried we were equal to it. We defended brilliantly at times, defenders got blocks on, midfielders got back to win balls and, all in all, they didn’t create too many chances. When they did, they spurned them and only once did Tom have a save to make and that was a relatively easy stop. Even so, at 1-0 and with points needed, it gets more and more tense. The nerves jangled in the stands every time they went forward and the frustration was shown by some when we didn’t pile forward. I remember seeing the clock move on to 75 minutes and worrying that there was still too long to go. I then saw JBG getting ready to come on and presumed it would be for McNeil. It was, but the youngster put a stop to that and in doing so calmed the nerves of every Burnley fan inside Turf Moor along with those watching or listening to the game elsewhere. It all started with a Wolves player having the ball in their own left-back position. Hendrick burst forward to put him under pressure and forced him into a hurried clearance. It reached the centre circle with James Tarkowski winning his header although I can’t imagine he could have thought at that time it would get him his first assist of the season. It found McNeil some distance from the Wolves’ penalty area. As he moved forward, Wood made a run to the left which took a defender away. Even so, McNeil still had plenty to do and he did it. He got into the box, manoeuvred himself into position before turning to fire left footed into the far bottom corner. Embed from Getty ImagesHe’d clinched the win, no doubt about that. Wolves were finished and we’d got the points. One header over the bar apart, they hardly threatened us. As for McNeil, his reward was another ten minutes on the pitch and then the substitution which allowed him another standing ovation from the home crowd. We are nowhere near safe yet, but these three much needed points have pushed us so much closer. On a day when we kept a first clean sheet in nine games, the goals we scored took us past the number we scored in the whole of last season when we finished seventh. Six to play now, three at home and three away. We still need some points but I think we are all feeling a bit better now than we were a couple of days ago. Burnley: Tom Heaton, Phil Bardsley, James Tarkowski, Ben Mee, Charlie Taylor, Jeff Hendrick, Ashley Westwood, Jack Cork, Dwight McNeil (Jόhann Berg Guðmundsson 87), Ashley Barnes, Chris Wood. Subs not used: Joe Hart, Matt Lowton, Ben Gibson, Stephen Ward, Robbie Brady, Matěj Vydra. Wolves: Rui Patrício, Romain Saïss, Conor Coady, Willy Boly, Adama Traoré (Hélder Costa 72), Leander Dendoncker (Matt Doherty 59), Rúben Neves, João Moutinho, Jonny Otto, Ivan Cavaleiro Raúl Jiminéz 59), Diogo Jota. Subs not used: John Ruddy, Rúban Vinagre, Max Kilman, Morgan Gibbs-White. 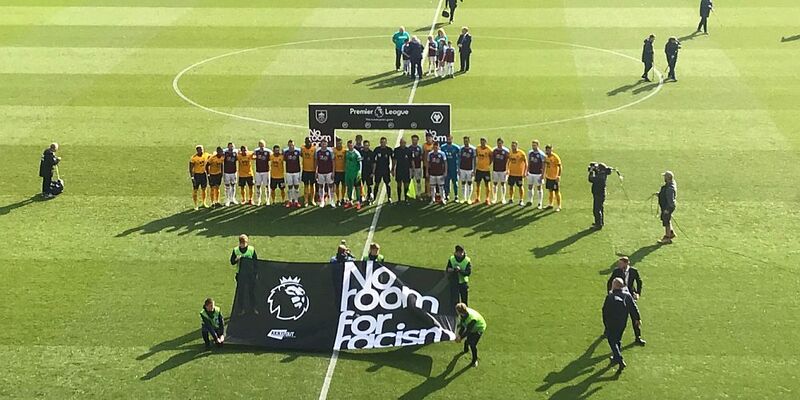 Footnote: As the photograph at the top shows, yesterday the Premier League launched the No room for racism campaign. Given recent events, I’m sure everyone will hope it has a positive effect.